CSW-H85F was certified by FCC. 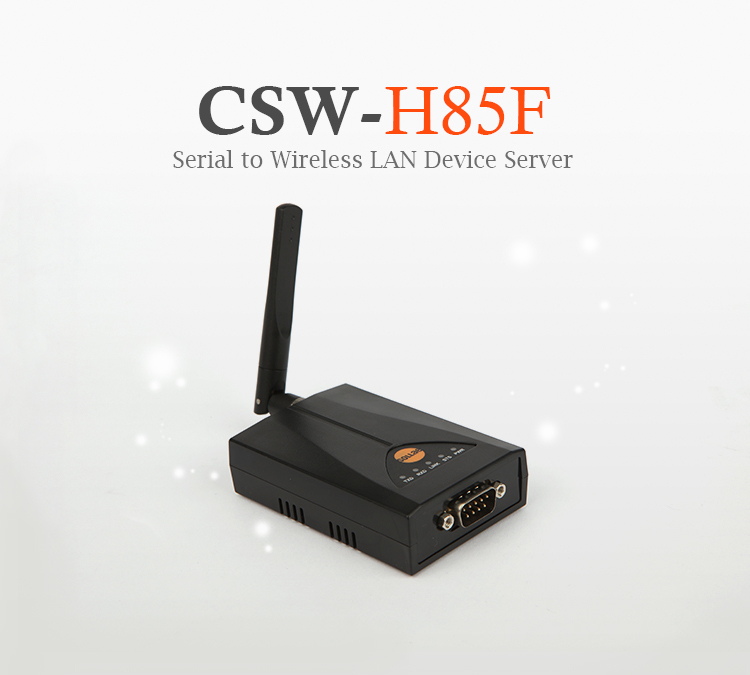 For non-US area customers, we recommend CSW-H85K2. CSW-H85F is a serial to wireless LAN adapter that enables you to add wireless networking capabilities to your industrial equipment via RS232, RS422 and RS485. So by applying this wireless LAN adapter, you can control and monitor your serial devices from anywhere in the world over wireless LAN. As well as basic functions, this serial to wireless LAN adapter contains more developed features in simple black design. CSW-H85F comes preloaded with Wireless RSSI and Soft AP that makes it convenient and easier for you to manage your products with mobile devices such as smart phones, tablet PCs and laptops where wireless LAN network is inaccessible. Also, this wireless LAN adapter is embedded with the IPv4/IPv6 dual stacks so that it can help you take the necessary steps to handle a transition to IPv6. 2 What is different between CSW-H80, CSW-H85K and CSW-H85F?